Blog search engine Sphere has kept a relatively quiet profile recently. After a private beta launch in late 2005 and a big-press full launch in the spring of 2006, they’ve kept mostly to themselves. Instead of focusing on building a better blog search engine (an area that Google now dominates after a recent Technorati refocus), Sphere has spent its time developing technology that automatically finds blog posts related to whatever a user is looking at currently. The product, called SphereIt, has been added to around 20,000 blogs (including TechCrunch, see the end of any blog post) and gives users additional reading material on the topic of the article or post. It is one of the top 50 plugins for WordPress-based blogs. But the company, led by CEO Tony Conrad, isn’t just attacking the market from a bottom up approach. They have also been closing deals with some of the biggest news sites in the U.S. Deals with The Wall Street Journal, CNN, The New York Times (Tech & Science sections), AOL News, TIME, Dow Jones Market Watch, CBS News, AOL Entertainment, NBC Access Hollywood, Media General Affiliates, AOL Sports, ZDNet Blogs, DWELL, About.com and others were all announced recently on the Sphere blog. These news sites and 20,000 blogs all have Sphere results included on story pages – see this story on CNN for an example, or the screen shot above for the WSJ implementation. That’s well over 1 billion page views per month with Sphere links and results. Competitor Technorati has pursued deals with these and other sites to promote their results as well. But Technorati only returns results linking to that particular story, meaning most relevant content is ignored. Sphere instead analyzes indexed blogs and performs a semantic analysis on the text to determine relevance. 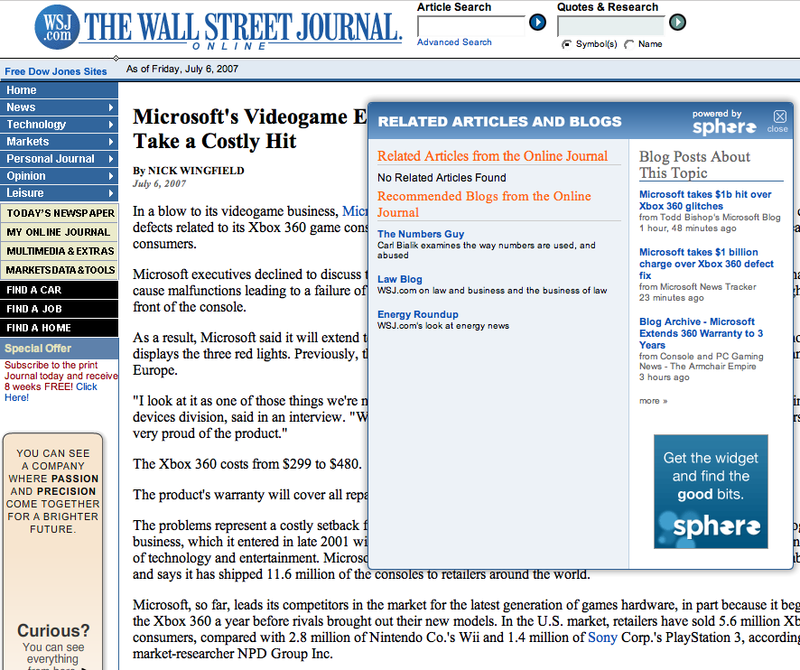 The results are strikingly better – and the fact that the WSJ dropped Technorati and added Sphere attests to that. Sphere doesn’t pay any of these sites to include their results. Instead, they will serve advertising in the results and share the revenue with the partners. The company has done a lot with just under $4 million in venture capital and 9 employees. They’re technology seems to be proving valuable to partners…which makes them perfect acquisition bait down the road. I don’t expect to see Sphere in the deadpool any time soon.